We're down to the Top Story of 2018, and the fact is that it wasn't just one moment. It's a series of moments in which one athlete broke the longest standing State Record and then extended it on three other occasions. There's no question that 2018 was the year of Tyson Jones. 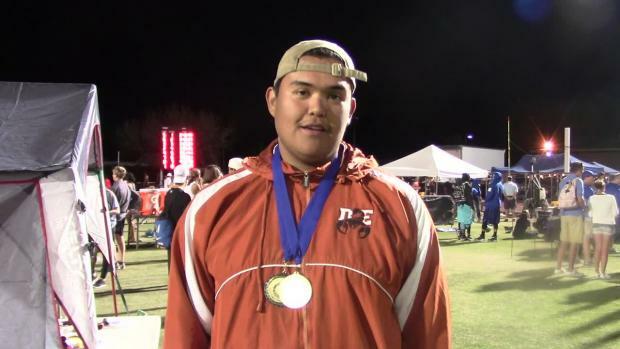 If wasn't enough to break the Dallas Long's (North HS, '58) 60-year-old Shot-Put State Record, the Desert Edge graduate who is now at Virginia Tech, snapped it four different times and threw 70'+ marks at five different meets. Have a look at our summary of Tyson Jones' season progression which makes his performances our No. 1 Story of 2018. Jones opened his outdoor season with a solid toss of 69-6.5 in the Shot Put at the Buckeye Lions Invitational to best Long's record of 69-03. A few weeks later, Jones received a congratulatory letter and autographed photo from Long. "It's about time someone broke my 1958 high school record. It's taken 60 years for someone to do so! Congratulations and Best wishes to you!" Next up was the Willie Williams Invitational, in which the Desert Edge titan broke the 70-foot barrier for the first time. He won the event by over 20 feet and he while he set a national leading mark and State Record of 70-4.5, he on one occasion mistakenly fouled a 72-footer. "In any rotational throw when you hit the block properly and the delivery side goes through it, your speed and everything comes to a stop. Energy is transferred to the implement and fouling becomes easy to control," explains Jones' club coach Coach Erik Johnson of Arete Throws Nation. "For Tyson," he says, "part of the problem at Willie Williams was that he hit that 72 and it felt so easy that he didn't think it was very good." Jones fell sick during the last week of March, and missed two-and-a-half days from school and lost two pounds. The following week he threw again at the Sun Angel Classic, where he was back in shape and won the shot-put contest with a throw of 67-09.25, but still with no gas. 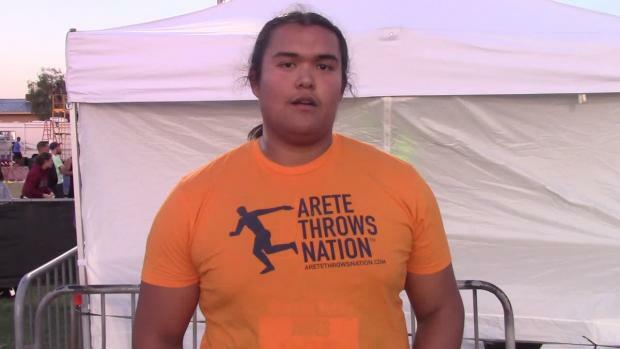 The real magic happened on Saturday, April at the Westside Invitational in Glendale where he dominated the rotational throws contests. He extended the Shot-Put State Record to 70-6 and then he threw 175-10 to clinch the victory in the Discus Throw as well. 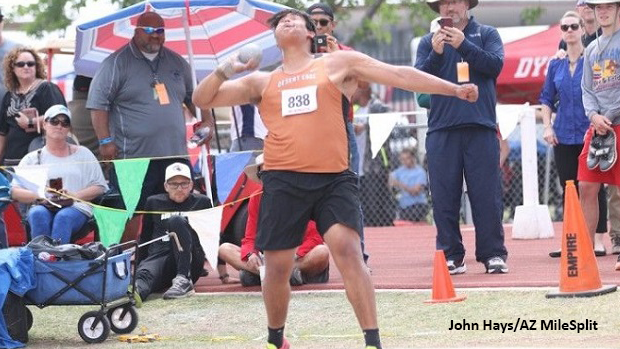 Tyson had been the national leader for the past month, and at the AIA State Championships he clinched his second and third State Titles in the D2 Boys Shot and Discus competitions. The following week, he was passed up by John Meyer (Lockport Township) who threw 70-6.5 at the Southwest Suburban Boys Conference. It took a last-minute effort to get Jones into an elite field for one last competition in Arizona, but on Thursday May 17th, Jones ventured south to Tucson, AZ for the Tucson Elite Classic at the University of Arizona's Drachman Stadium. 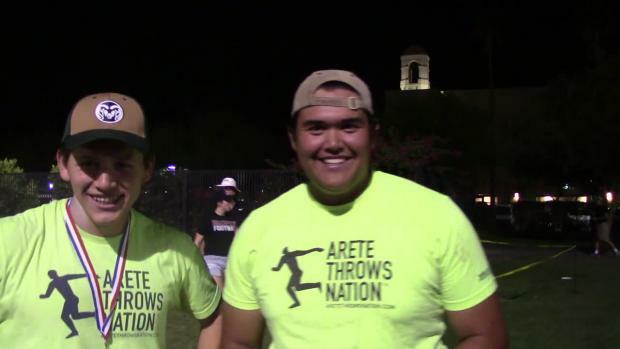 "He's an elite thrower but when you put him up against college age guys throwing the 16 lb. shot, you can tell he's a kid," said Coach Johnson. On his fourth toss, Jones launched the 12 lb. cannonball 71-8.75 to finally break through 71-feet and record a new Arizona State Record for the 4th time this season. A month later, Jones capped off his high school career with a 70-1.5 toss at the New Balance Outdoor National Championships for a National Title.